Steal from the rich and give to the poor can be a useful lesson to teach your kids – though you may want to tweak it a bit so they aren’t actually stealing from anyone! Kids are already quite apt to live this mantra by nature – most kids are caring and can see inequities much better than their adult counterparts. But being Robin Hood isn’t all about work – he liked adventure just as much as the next person, probably much more, actually. Getting out and about in the forest and making new friends was something Robin Hood was quite skilled at as I’m sure you wish your kids were! Turn your child into the prince of thieves and the savior of Nottingham in this Kids Robin Hood Costume. This kids costume comes with an olive green hooded shirt and vest combo that has long sleeves and a front placket with brown cord for lacing. The brown suede vest panels fast at the front with three faux leather buckled straps. The details are what truly make this costume stand out: from the matching faux suede gauntlets with padded forearm guards (you know, for all of the arrow shooting), to the matching cuffed boot covers and the pouch that attaches to the black faux leather belt with Velcro. The details really bring this costume to life! Add a bow and arrow set for the legendary archer, and your little adventurer will be ready to lead his merry men against the evil Sheriff of Nottingham! My son wanted to be Robin Hood for Halloween. We are loyal Halloweencostumes.com shoppers and have purchased many costumes from here over the years. I am generally happy and even impressed with the quality of the costumes we've purchased. This year with this costume I am disappointed. The costume seems to run slightly small and the buckles/straps across the chest and abdomen areas are a joke. They are flimsy, poorly constructed, and don't stay buckled. The material used to construct them to look like leather separated and flaked off. 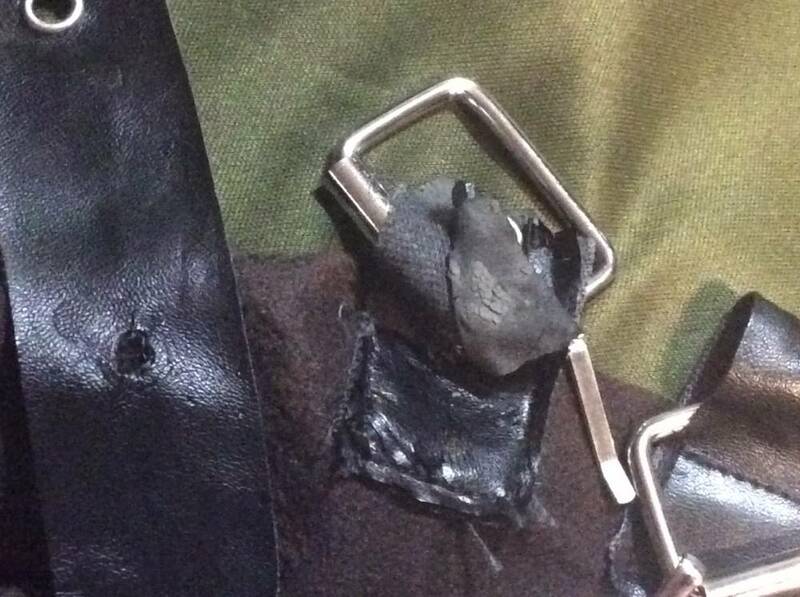 The metal grommets fell off after only a few minutes of wear when trying the costume on. Normally I wouldn't write a review but seeing as we paid a decent amount for this costume and seeing as the buckles/straps are a prominent aspect on the costume, I felt it necessary to alert other consumers thinking of buying this. Overall, I am happy (and my son was happy) with the rest of the costume. All other pieces of the costume have held up well. I definitely would not repurchase this. This costume was falling apart after my son only tried it on. Looked even worse after 1 night of trick or treating and he didn't even want to wear it all night because it looked so bad. Really cheaply made for what it cost. Very cheaply made hope it makes it through the day the buckles dont stay closed looks like a hot mess and the belt is to vig had to staple it to keep in on my poor kids waist. And the fabric for the arm and leg parts riped the moment they were put on. 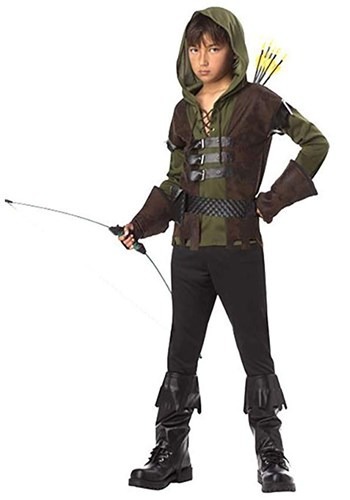 My son decided to be Robin Hood for Halloween and found this costume online. I tried for days to get it both online and at various retailers, but it was sold out everywhere. But not at Halloweencostumes.com... Thank you so much for having it in stock! He was so excited to get it in the mail and loved getting into character. Not only that, but the best price too! And it arrived just in time as I didn't find it until just days before Halloween. He was very happy. My only complaint was that it seems maybe it might run small, but we made it work.